Over the years I have always tried to take care of my skin and make sure that it is well moisturised (no-one likes having scaly skin!) but with increasing regularity it has become a necessity. Since the age of 18 I have slowly built up my collection of body art and this demands a certain level of care in the healing process but also the maintenance of colour. Tattooing has become increasingly popular and recent surveys show that 1 in 4 adults in the UK have one. This has led to certain companies capitalising on this ‘new’ phenomenon and producing lotions and potions specifically designed for tattoos. Although this is all well and good, you can get products that will look after your tattoo just as well (if not better) that aren’t in the tattoo aftercare market and probably cost a whole lot less. 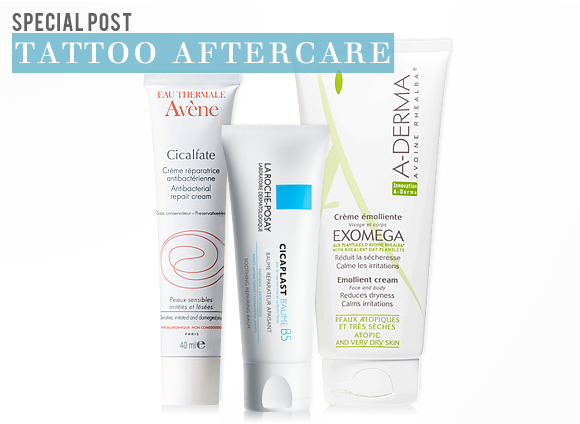 In this blog post I’ll be letting you know which products are best (in my opinion) in moisturising your tattoo during and after the healing process to ensure you get the best possible result, after all it is a lifetime investment. It might sound gruesome but unfortunately it’s true, your tattoo is an open wound and you need to be extra careful to keep it clean, especially if you work in a dusty environment etc. Prevention is much better than cure so this formulation of micronized copper sulphate and zinc sulphate, aids in tissue regeneration and the soothing of the skin and helps to prevent infection. It’s also extra gentle on your skin as it is non-comodogenic, hypoallergenic and paraben-free. This product is bought just as much by people wanting their tattoos to heal well, as mothers with nappy rash afflicted babies; it’s a staple product which has gained a cult status within the tattoo industry. Ultra moisturising and a little on the thick side, it might be better for tattoos that are exposed to the elements so it doesn’t stain your clothes. That being said it is an excellent barrier and keeps the bad stuff out but the moisture in. In my opinion, this is one of the best emollient creams out there as it restores the layer of oil on the surface of the skin to slow water loss and doesn’t make the area it is applied to sticky (if you prefer a thicker formulation try Diprobase Ointment). It is light but is deeply moisturising, nourishing and is specifically designed for people with eczema or dermatitis. Available behind the counter at any good pharmacy, it is readily available and at least half the price of other well known ‘tattoo’ creams. This balm is highly reparative and extra gently on your skin, it’s formulated for use by the whole family and can be used anywhere on the body (try and avoid your eyes though!). It has a 5% concentration of Panthenol (the main ingredient in Bepanthen) plus Madecassoside which acts as an anti-inflammatory. When you apply this as a generous layer twice daily it helps speed up the skins recovery time and aids with that tight sensation that can occur after tattooing. La Roche Posay is known for their paraben free formulations and this is no exception. Treat your skin kindly and it will forgive you for getting it tattooed! While all the products I’ve spoken about are great just during the healing process, this product is great after it has healed too. It is super moisturising so it helps with healing but is also great once the tattoo has healed as the vitamins help to keep the colour bright and fresh. No dull tattoo’s for you! It’s great as an all round moisturiser and because it is specifically designed for atopic skin it is the gentlest of the gentle, which is always nice after the stress your skin has been through. Just remember, tattoos are an investment, they aren’t cheap to get but that doesn’t mean they can’t be cheap to look after. Make sure it’s kept clean, moisturised and protected with a decent SPF when you go around showing it off. UVA and UVB rays are one of the most harmful things in terms of colour disintegration and no-one likes a faded tattoo. Most importantly though, enjoy the tattoo, it’ll be with you for a very long time! i have bought this product for a long time for my husband who when i met him had always suffered with sore ,thin breaking skin on his face. He had only been prescribed hydrocortizone cream from his gp and it did nothing, i read an article in a paper and thought we would try it , it was amazing and cleared and relieved his skin in no time at all now its the only range he will use on his skin. He has forgotten to pack it when working away or on the odd wkend away and within a day his skin becomes tight and irritated he swears by it. So i say please try it. This entry was posted on Thursday, January 17th, 2013 at 9:00 am and is filed under Skincare. You can follow any responses to this entry through the RSS 2.0 feed. You can skip to the end and leave a response. Pinging is currently not allowed. This is interesting. I know each artist generally has different advice but I let mine “wet” heal. So it was covered until the flaking stage with cling film… changed frequently and in addition to Bepanthen. No itching, no scabbing, nothing but a perfect tattoo! Hi Charlie, I’m glad you like the post. There is so much variation in advice and everybody has their own experiences with the healing process. I tend to keep mine as moisturised and clean as possible but exposed to the elements as it were (not very good when you have a thigh tattoo in January!) less pleasant at the flakey stage but overall pretty quick healing time and a lovely end result!